Explore how social media became a vehicle for social change. Around a year ago, news of Harvey Weinstein's history of misconduct broke. It sparked a new movement across social media, with women across the world expressing solidarity with the victims of sexual harassment and assault by tagging their stories #MeToo. Since then, the movement has snowballed. 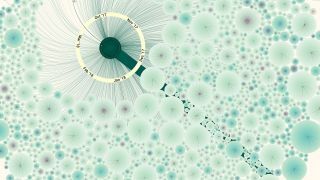 Award-winning data visualisation designer Valentina D'Efilippo decided to chart its development in an interactive infographic, entitled MeToomentum. "The genesis of this project was a rather simple question," she explains. "Can social media become a vehicle to foster social change, and help reshape traditional views?" The design includes information about the themes, geographical footprint and key moments. Users can click on different elements to read individual tweets and explore conversations surrounding them, or explore the timeline of events to see how the phenomenon developed. It's a fascinating piece of data visualisation, not only in terms of content, but also in capturing how social media can define a phenomenon (D'Efilippo labels it 'the anatomy of a hashtag'). It focuses on the first six months of the movement, and analyses around 200,000 tweets from that time, gathered using the Twitter API. "When it came to outlining the visual structure, we were seeking a metaphor to reinforce some of the movements key characteristics – its complexity, its ability to spread and take hold, and its representation of both strength and fragility," she comments. They settled on a dandelion. "Often considered a weed – and certainly a pest to anyone pursuing the perfect green patch – the dandelion is renowned for its ability to spread and grow anywhere," she adds. "But from another angle, the dandelion is a beautiful and complex flower. One which has been used in popular culture to symbolise endurance, growth, and the possibility of change." Read more about how D'Efilippo created the MeToomentum infographic in this Medium post.